When you try to open file types created in previous versions of Office (like a Word 95 document), the file will open in Protected View by default and the editing functions will be disabled. If the File Block settings configured by you or your administrator are set to Do not open selected file types, the file won’t open in Protected View and an error message appears. See the File Block settings explained section for more information. The following are examples of the Message Bar for File Block. The yellow shield indicates the file can be edited, and the red shield indicates the file can’t be edited. You can make changes in the File Block area of the Trust Center that will let you open, edit, and save your blocked file. Click Trust Center > Trust Center Settings > File Block Settings. Check the Open selected file types in Protected View and allow editing box. 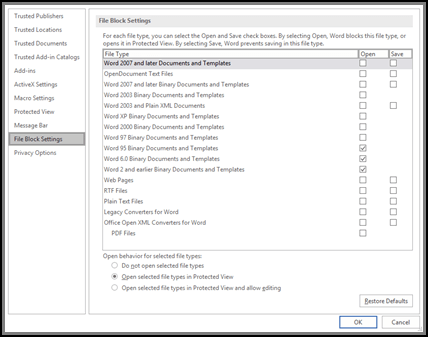 In the File Type list, check or uncheck Open or Save for the file types you want to block or enable. Note: You can’t check Open without checking Save. Do not open selected file types The file types selected with check marks are blocked from opening, or opening and saving. You will see an error message when this is set. Open selected file types in Protected View Selected file types open in Protected View. The Enable Editing button is disabled on the Message Bar and in the Backstage view. Open selected file types in Protected View and allow editing Selected file types open in Protected View. The Enable Editing button is enabled on the Message Bar and in the Backstage view. Note: If you work in an organization, your administrator might have set policy that doesn’t allow you to edit files that are blocked.